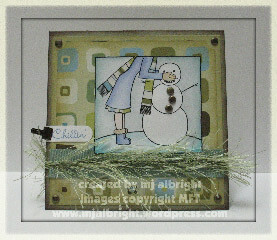 Here is another take on MFT’s Baby it’s Cold Outside stamp set. But first, I wanted to share with you this bizarre pic (somewhat scary — from my vacation). Looks like a shark right? 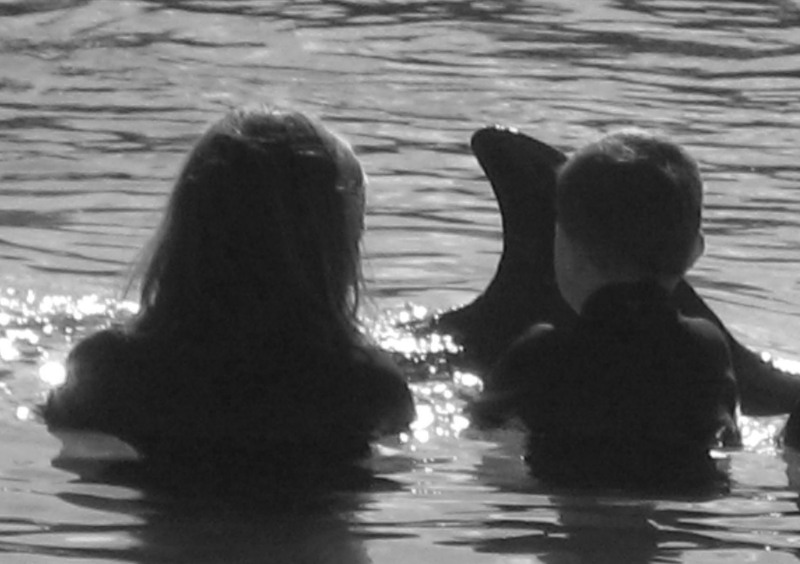 Well, it’s a dolphin. What a cool pic I will be sending out to my family to trick them…he! he! I love these colors. I used KI Memories My Guy Disco Fever & My Guy Funky Stripe Patterned Papers. Also, pulled out my stash of Adornaments Vegetation Fibers to add a little flair on top of a strip of ribbon from Jersey Ribbon Originals. The card size is 4-1/4″ x 8-1/2″ Mellow Moss CS folded in half with edges sponged with Chocolate Chip ink. Next layer is 4″ x 4″ of River Rock CS and edges sponged with River Rock ink. Top layer is 3-3/4″ x 3-3/4″ Disco Fever Patterned Paper and edges sponged with River Rock ink and Ticket Corner Punch to all 4 corners. Added 4 Pewter Brads from Vintage Assortment (also added to snowman buttons to coordinate). Sentiment stamped with Brocade Blue ink on Papertrey White CS and punched out with Word Window Punch and held to card with a SU! Pewter Mini Library Clip. The main image was stamped with Stazon Jet Black ink. Used Aqua-Painter, Soft Sky, Brocade Blue, and good ol’ Cool Caribbean inks. Stamped image again on Funky Stripe Patterned Paper, cut out, and adhered to images scarf & bottom of dress. CARDSTOCK USED: SU! Mellow Moss & River Rock CS; Papertrey White CS; KI Memories My Guy Disco Fever & Funky Stripe. INKS USED: Stazon Jet Black; SU! Brocade Blue, River Rock, Soft Sky, and Cool Caribbean. ACCESSORIES USED: Vintage Brads Assortment; Mini Library Clips; Adornaments Vegetation Fun Fibers (EK Success); Aqua Painter; Ticket Corner Punch; Stampin’ Sponges; Jersey Ribbon Originals; Word Window Punch. 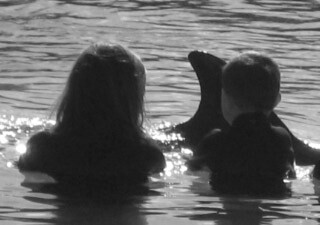 Hope to chat with you Wednesday evening over at SCS MFT FORUM. I absolutley love this card! the fiber looks so much like a pine branch! That little library clip is so stinkin’ cute on this! I cant believe I forgot to order those, so sad. That’s a cute picture, and pretty funny about your bad hair day. Only because I would do the same! You are too funny. . .a bad hair day! LOL LOVE that card! The colors are yummy!